But a handful of local restaurants, cafés, and restaurant groups are already taking action, law or no law. Here’s where you can expect not to find plastic straws right now. This morning, CNBC revealed that CEO Randy Garutti has officially joined the cause: His team plans to eliminate plastic straws at its restaurants by Q1 of 2019. 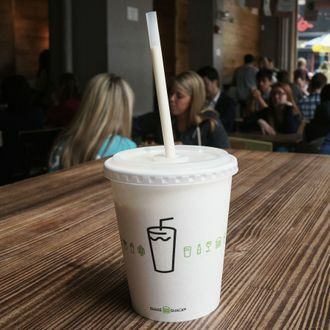 Danny Meyer played a pretty pivotal role in the still-controversial no-tipping movement, so it’s no surprise that his Union Square Hospitality Group was one of the earliest proponents of the anti-plastic-straw movement. In mid-May, Meyer announced that his restaurants would only use biodegradable straws starting this summer. Plastic and the ocean simply don’t mix. So, it’s no surprise that the Rockaway Beach Surf Club went plastic-straw-free this summer. On July 14, the restaurant announced that in addition to having biodegradable cups and straws, they are also selling metal straws, which include a $2 discount on frozen drinks. This year, the global coffee chain finally acknowledged that it has played a major role in the amount of plastic waste in landfills around the world. In response, Starbucks announced in July that it will go “strawless” by 2020. Instead, some of its drinks will be served with new strawless lids, while others will feature straws made of alternative materials. The whole process will begin with a phased rollout in the U.S. and Canada next year. Yesterday, the coffee shop owned by Cherry Bombe’s Kerry Diamond announced that next year it will go completely single-use-plastic-free. Effective January 1, the café will ban single-use-plastic cups, lids, takeout containers, or utensils. Until then, customers who bring in reusable cups will get 10 percent off their drink order. Like we said, plastic straws and the ocean really don’t mix. That’s why the New York Aquarium launched the Give a Sip campaign, which has recruited more than 100 restaurants and organizations in the city to give them up. Among their partners are Matter House (Café Altro Paradiso, Flora Bar, and Estela), Cosme, Achilles Heel, Lalito, Café Boulud (and the rest of the Dinex Group), Uncle Boons, and more. See the whole list here.